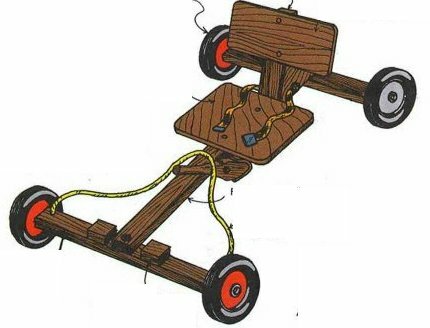 Scouts will be racing their dens' race cars from the top of the ramp... then being launched by the power of gravity... with nerves of steel... steering their Cubmobile across the finish line... and occasionally... at the end... remembering to HIT THE BRAKE!! Be sure to reply by March 11 to this invitation so we can have an accurate head count for the event. We hope to see you all on race day!! Everyone had a great time at today's Cubmobile races. It was fun to see all the cubs scouts race down the track! Special thanks to all who helped with the organization, setup, score keeping, car handling, announcing, safety patroling & cleanup. I'd like to especially recognize Rennie W for organizing the event & John P for being such an entertaining MC! Also thanks to all volunteer parents & siblings including Russ D, Dillon D, Paul R, Brandon R, John F, Macey Z , Steve J, Scott E & Mimi (& friends) E.
We look forward to seeing everyone next Friday, 05/21/10 at the last Pack meeting of the year. Remember, start time is 6:15pm. We are going to have a special Movie night following the meeting. We'll plan to be done by 9pm. 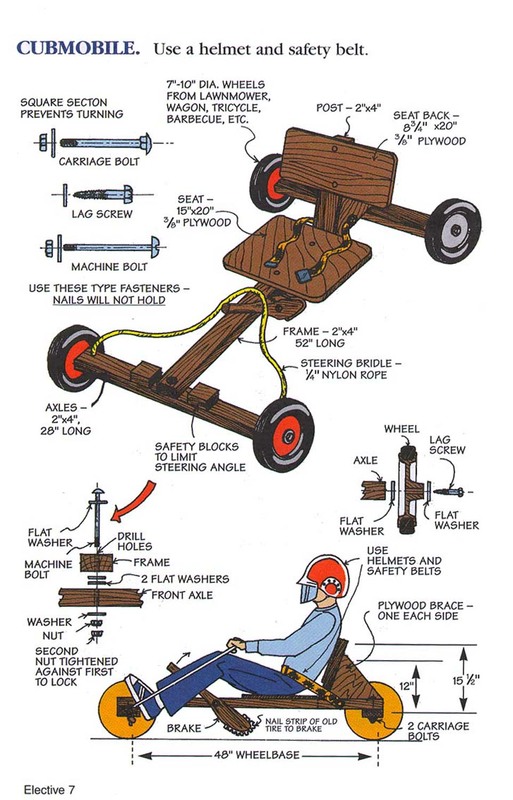 Here is the step-by-step instructions for building a CubMobile for the upcoming race. Click to open or download the file. Good luck! The most fun and exciting event is almost upon us, the Cubmobile Race will be held on Sunday, May 16th from Noon-3 PM. 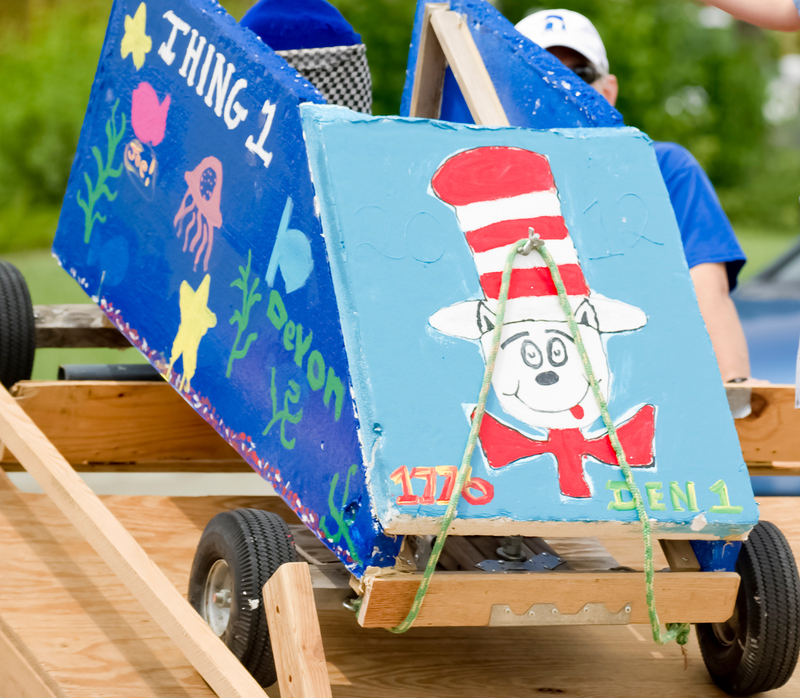 The Scouts of Pack 1776 will be racing their dens' Cubmobile from the top of the ramp… then being launched by the power of gravity… with nerves of steel… steering their Cubmobile across the finish line… and occasionally… at the end… remembering to HIT THE BRAKE!! This is a timed event, every Scout will race at least twice, and everyone wins a medal for participating. The Scouts LOVE this event and we hope to see you ALL on the race day. * In contrast with the Pinewood Derby, it is o.k. to recycle old cubmobile carcasses from prior years if your den has access to one. * Tires must be 10 inches or less in diameter. * Any rubber tires are acceptable (hard rubber or pneumatic) EXCEPT bicycle tires. Bicycle tires and rims are not safe for this event! * Wheels may incorporate wheel bearings. 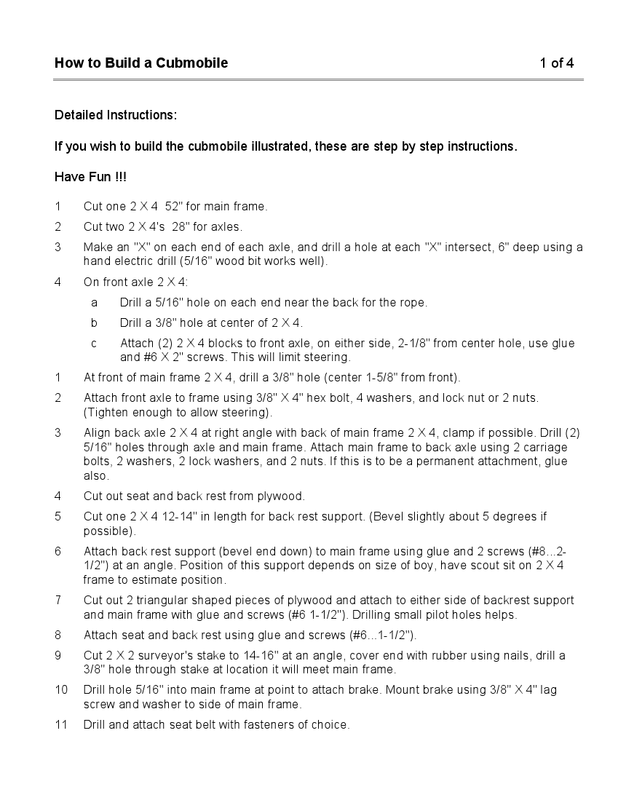 * All framing used in constructing the car should be maximum 2inX4in. * The turning radius of the cubmobile MUST BE LIMITED by a means such as blocks located less than ½-inch from the frame on the steering arm. * No additional weights may be added to the cars for the purpose of gaining momentum. Make the car strong enough to survive the race, but adding extra weights is not safe for the drivers or the poor dads at the finish line who have to stop the cars. Additional weights will be removed. * Don’t have any sharp objects on the car that could impale the driver or a spectator. * All cars must have a brake. * All cars must have a seat belt. * All racers must wear a helmet. * Decorate the cars as much as you can! Building cars is a tall order for especially the little guys, but painting and decorating them is fun for everyone! Volunteers are needed and your Den Leaders will be contacting you!